Cardamine pratensis in a Wiltshire meadow. Flowers make the best subjects to focus on when meditating. Their delicate and symmetrical beauty are great at quietening the mind. And if you want to do some work on the crown chakra – the place at the very top of your head that may, sometimes, tingle when you are inspired or feel connected with the universal – then may I offer you this image of Cardamine pratensis, also known as Ladies’ Smock, or Cuckoo Flower? The thing about Ladies Smock is that the flowers are absolutely at the meeting point between lilac and white – the perfect colour to depict, or represent the crown chakra. And yet it avoids the commonest problem when meditating on this colour: being ungrounded. The commonest crystal for the crown chakra is the amethyst. And yet, I admit I have a problem with amethyst. Though beautiful, it makes me feel ungrounded, too much ‘in my head’… just too purple. 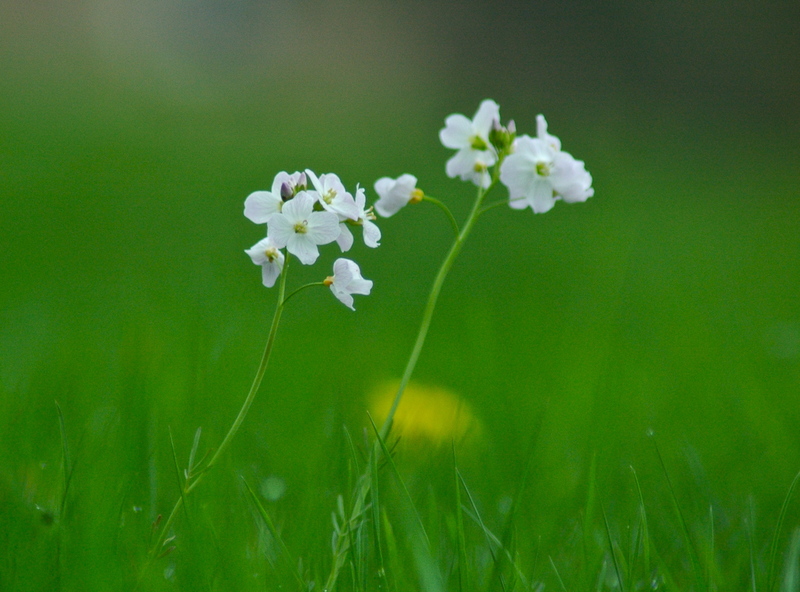 In contrast, Ladies’ Smock is very connected with the ground: it’s long graceful stem leads downwards, to good roots. And the vibrant green colour of the stem and leaves, not to mention the neighbouring countryside, is the perfect antidote to too much purple. The whiteness – there is more white than purple in this example – connects us more to the universal than the individual, so it’s easier to let go of the ego and all those ego insecurities. And, as a bonus, Ladies Smock does also have very practical health and nutritional benefits – once used widely as an alternative to watercress, the flowers and leaves make a tasty addition to salad. The leaves taste amazing, though maybe a tiny bit chewy for modern taste. The flowers have the same mustard and cress flavour, and are easier to eat. The plant is rich in Vitamin C, and also in mustard oil compounds, so they are pretty good for the circulation and chasing phlegmy winter bugs away. So, Cardamine pratensis is a beautiful subject for meditation, and you can eat it as well… a small amount is its own flower remedy, warming and reassuring. Ladies Smock likes damp meadows, in temperate zones. I photographed this close by the Studio, with a lovely long lens to enable us to focus on the flower, and not a cluttered background – the essence of meditation. are simply powerfiul – thank you for all your loving care and interesting comments. Looking forward to seeing you soon.